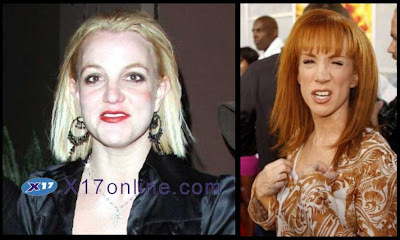 Britney is Back; As Kathy Griffin? Holy Kathy Griffin lookalike Batman! So after Britney hit the deck at club Pure on New Years Eve she was nowhere to be found, but then the folks over at X17 found her last night leaving dinner and then heading right over to Les Deux, which is French for “Drunken Mother Whom Abandons Her Children.” Yes, I speak French. According to those paparazzi, Britney was out until 2:30 AM. Good for her. I say more partying and less kids. I mean, that’s the motto at the abortion clinic, right?